Buddhists have carried out a campaign against evangelicals and churches in Sri Lanka warning them to cease their religious activities in majority Buddhist villages. Ravana Balaya, a radical Sinhalese Buddhist nationalist organization, visited more than 20 evangelical prayer services from July 15 to 19 in Polonnaruwa and told pastors to stop holding services and cease trying to convert Buddhists and Hindus, according to the Venerable Ittekande Saddhatissa Thero, General Secretary of Ravana Balaya. In the past year, about 60 churches and evangelical prayer centers have been targeted. 120 had been attacked in 2013, according to the National Christian Evangelical Alliance (NCCA). “Many pastors have been beaten and threatened to halt their prayer meetings,” said Godfrey Yogarajah, General Secretary of NCCA. “People have logged complaints in police stations but it is very rare that culprits are identified,” he said. “Many of the mobs who have attacked prayer gatherings have been led by Buddhist monks,” said Yogarajah, adding that monks have faced no legal repercussions for these acts of violence. In two other incidents, Christians were taken to the hospital after sustaining injuries by a violent mob. A pastor was knocked unconscious in a raid on his home on 12 May. His family and four other Christians were also attacked. In a meeting with the police about an incident when the four had been threatened for holding a prayer meeting in their home. While waiting for the police, about 150 people surrounded the house and began shouting at them. 40 people broke through the security fence around the property; attacked the pastor’s van, forced their way into the house and attacking those inside. When the police arrived ten minutes after the mob dispersed and took the Christians to the police station, held them for seven hours. No attempt was made to apprehend the offenders. Christians filed a case against their attackers, and a magistrate subsequently reprimanded the police and ordered them to arrest the perpetrators. In a separate incident, five monks and 20 youth stormed a prayer gathering at the home of a Christian family in Waththegama, Kandy district, on 15 May. Two strangers arrived and requested prayer, but was later found the mob had sent the pair as a set-up. While a Christian was praying for them, the assailants burst in and attacked the Christians. They dragged the Christian to the Buddhist temple, and drenched her with water subjecting her to a verbal and physical assault. One attacker choked her, threatening to kill her and warning her not to return to the village. A case was later filed against her for unethical conversions. The Constitution accords Buddhism the “foremost place” and commits the Government to protecting it, but does not recognize it as the state religion. The Constitution also provides for the right of members of other religious groups to freely practice their religious beliefs. While the Government publicly endorses religious freedom, in practice, minorities such as Christians and Muslims are subjected to violence. UN experts asked Sri Lankan government to take urgent steps to stop frequent racial and faith-based hatred and violence against Muslim and Christian communities by hardline Buddhist groups. UN Special Rapporteur on freedom of religion or belief Heiner Bielefeldt said. The Special Rapporteur on extra judicial, summary or arbitrary executions, Christof Heyns, called on authorities to take urgent and firm measures to bring the perpetrators of killings to justice, and ensure the immediate adoption of robust protective measures. 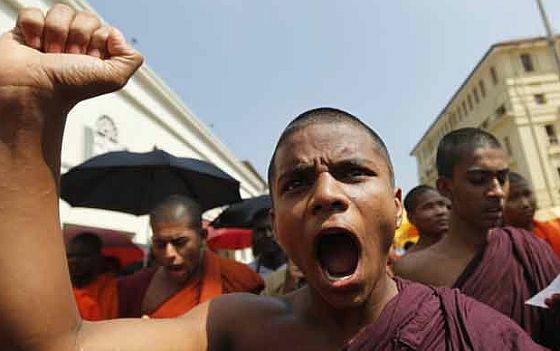 Hate statements by Buddhist extremist groups have contributed to spread a climate of fear among Sinhala Buddhists, who constitute the majority population in Sri Lanka, and resentment towards minorities. By VOICE OF THE PERSECUTED in Asia, Christian Persecution News, Sri Lanka on July 19, 2014 .